There must be butterflies on my brain! probably left over from the last post "Emerge". I had a dream about blue butterflies with pink bodies and look! 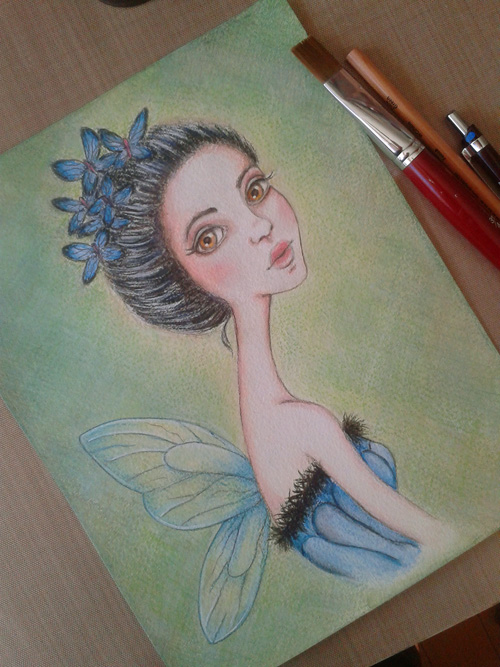 - A beautiful blue fairy on her way to the Fairy Ball agrees to take a few minutes out of her busy day to pose for me. I reach for my small tin of watercolour pencils and quickly get to work. I like to draw long necked girls but I think this girl might have the longest neck yet! It seems to work with the curve of the pose. I have large and small pieces of watercolour paper cut offs lying around. The smaller pieces I use for trying out colours and taking off excess paint or water but I was ignoring the larger pieces because they are all odd sizes. Now I find they are great for quick sketches or maybe cutting up into ATCs (Artist Trading Cards) which I have not tried doing yet. I wanted the butterflies in her hair to be more of an accessory piece. 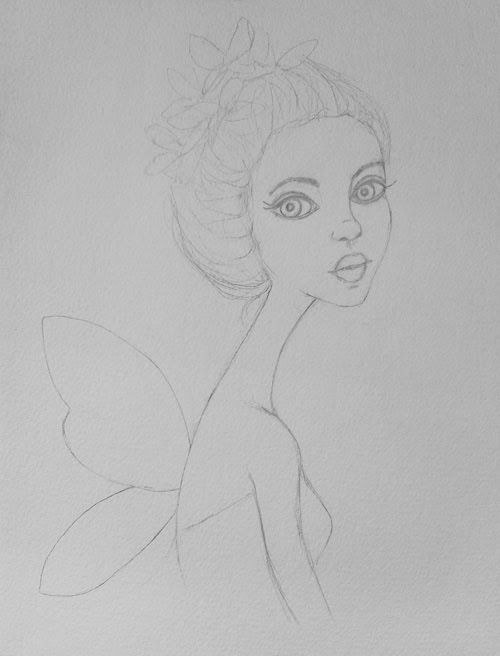 I decided to go with yellow orange eyes to add a little bit of interest to this whimsical fairy. The first layering of colour many artists call the ugly faze but I like to think of it as foundation layers, to which you build upon. 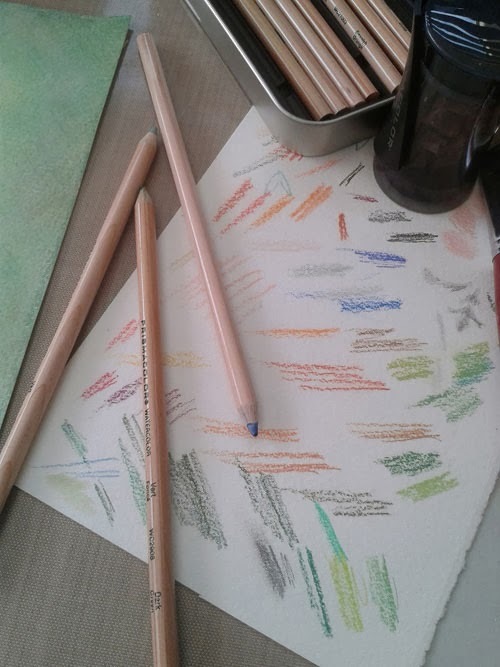 Just like working with paint, I built up the layers of watercolour pencils and activated them with water. A little warm white acrylic gives a softness to her skin. In the background I used a cross hatching technique which is enhanced with the rough texture of the cold pressed paper. 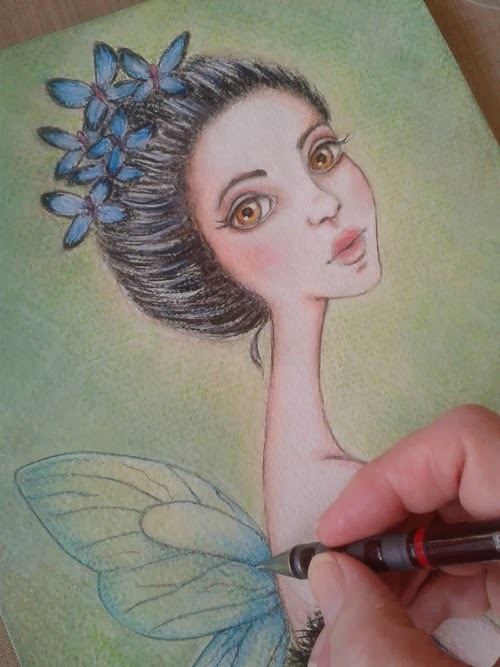 I manage to get finishing touches of white acrylic paint and graphite pencil for extra detail to this fairy before her friends came and whisked her off to the ball. This was a tricky task, as you might know it is very difficult for fairies to sit still, so I was quite pleased with this portrait. How do you think she turned out? Thanks Wendy, makes you wonder what she is thinking about, even I don't know! 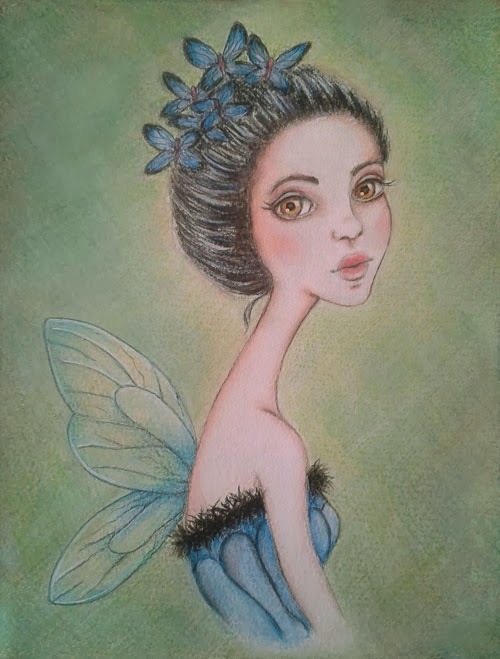 I love fairies too Scarlit, it makes this whimsical world all the more magical with them in it don't you think? I absolutely love all of your art. I think you are incredibly talented. Thank you so much Cathe, I am very much in that experimental stage of my artwork, whatever spills out of my head and art medium that lends a hand. Gorgeous. Love the soft colors. 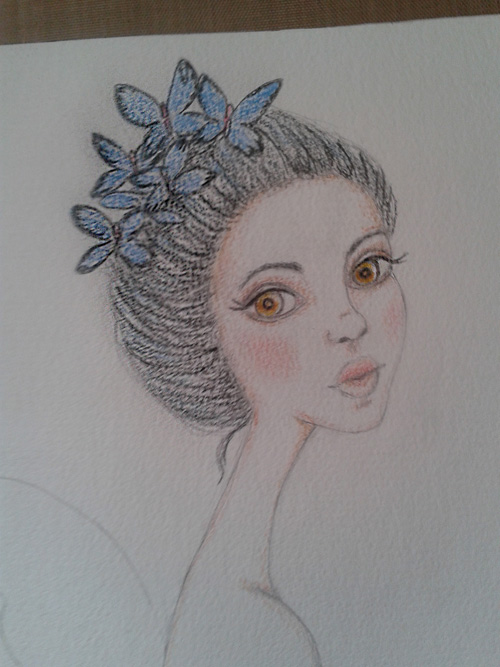 Thanks for that Kirstin, I felt the willowy look and colour choice of the eyes would bring her a little more into the fairy realm and of course, you have to have your butterfly hair accessory if you are going to the ball!